Active transportation, including walking, cycling, roller-blading and movements with mobility devices, is a healthy, cost-effective and environmentally-friendly way to travel. In the GTHA, it is estimated that 17 per cent of all trips are walkable (i.e. less than two kilometres in length) and 40 per cent are bikeable (i.e. less than five kilometres in length); however, walking and cycling currently account for just five per cent of all work trips and 32 per cent of all school trips in the region. An effective transportation system is one that makes provision for, and encourages, walking, cycling and other forms of active transportation. Complete walking and cycling networks with bike-sharing programs. 2.1 Plan and implement complete, integrated walking and cycling networks for the GTHA, including Toronto’s PATH system, that address key barriers such as bridges over 400-series highways, rail corridors and major rivers, and missing sidewalks on major roads. The cycling networks will bring every GTHA urban resident to within a maximum of one kilometre of a dedicated bicycling facility. This will be supported by a provincial funding commitment increased over time to at least $20 million per year for municipalities to complete the walking and cycling networks. 2.2 Create pilot bike-sharing programs in major urban centres. Bike and pedestrian networks provide safe and convenient opportunities for active transportation. Bike-sharing programs, such as Vélib in Paris, France, allow people to pickup and drop off bikes at stations located around the city. New infrastructure provides connectivity for cyclists and pedestrians over barriers, such as rivers and major roadways. 2.3 Research, standardize and promote best practices to integrate walking and cycling in road design, such as scramble intersections, bike boxes, and signal prioritization. 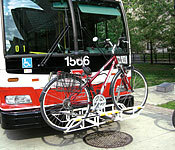 2.4 Install bike racks on all buses and Light Rail Transit (LRT) vehicles and amend both the Highway Traffic Act (Section 109) and the Public Vehicles Act (Sections 23 and 24) so that transit vehicles with bike racks do not require special permits. 2.5 Establish a coordinated, region-wide bicycle registry with the ability to report and search for stolen bikes. 2.6 Consider changes to the Highway Traffic Act that implement the 1998 recommendations of the Regional Coroner for Toronto to provide greater clarity with respect to the relationship between motorists and cyclists in areas such as safety equipment, lane positioning and passing procedures. 2.7 Implement or expand safe cycling training programs, similar to the Commuter Cycling Skills Course offered in the Vancouver area, or the CAN-BIKE courses offered by municipalities across Canada. 2.8 Undertake Active Transportation Master Plans and incorporate them into municipal Transportation Master Plans. BikeLinx is a $5 million Metrolinx initiative that will make it easier for people in the GTHA to combine bicycling with transit. Through the BikeLinx program, Metrolinx has provided funding to GTHA municipalities to equip every bus in their transit fleets with an external bike rack and to install permanent, secure and sheltered bicycle parking facilities at major transit stops. 2.9 Opportunities for promoting active transportation and connecting key destinations, including mobility hubs and major transit station areas, shall be identified and implemented when designing greenways strategies and park systems. 2.10 Enabling Official Plan policies to support active transportation shall be adopted. 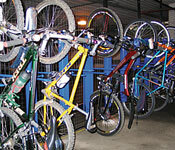 Where appropriate, the bonusing provisions under the Planning Act should be used to require that any application for major commercial, employment or multiple residential development, particularly in a mobility hub, provides appropriate facilities for cyclists and pedestrians such as secure bike storage, showers and change rooms. 2.11 School catchment areas shall be defined, and school campuses shall be designed, to maximize walking and cycling as the primary means of school travel. 2.12 Sidewalks should be required on all new regional and new local roads inside settlement areas.